Deveneys of Dundrum: July Tasting - Sunny days and Summer brews. July Tasting - Sunny days and Summer brews. Every year Round 1 of Off-Licence of the year commences at the end of June, unfortunately, I have a mental block with regards to this date. Whilst sunning myself on a beach in Barcelona and soaking up the local 'stuff your face' culture, Fiana was making her rounds of the Dublin Off-Licences. I returned just in time and I'm hoping Round 1 was successful. Definitely broke a sweat though. Hence my lack of presence on this blog so apologies. We've loads of new gear in for you guys to try. I have spent the last week considering the July tasting line-up and finally come to my decision. The worry was that the stock wasn't available but 5/6 beers have been secured and its a toss up for number 6. We've titled the July tasting : Summer Brews. An eclectic mix of seasonal beers from all over. Hope this appeals to you all. We are back to the usual format of the 3rd Thursday of the month. This lands on Thursday the 23rd July, same old drill 6.30pm - 8pm, Deveney's Dundrum. 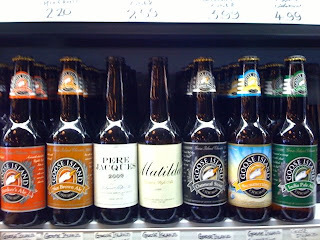 Some interesting stuff, Goose Island Summertime. Haymaker, Sunburst, Pitchfork, Summer Lightening and ???? ?, maybe something for myself - a Chick Beer - as you lads like to call it!!! Have loads of new gear to taste so over the next few nights you'll see some new posts on the Blog...... Really really tough job but I'm all about the sacrifice to keep you well informed. Labels: July Tasting - Sunny days and Summer brews. i've been drinking the most amazing aussie peach beer the last few weeks... got it in supervalu!